A few know her only as “Ed’s wife”. The couple operated Movies & Munchies for several years. But Mary is also a proud member of the Tla-o-qui-aht Nation and the Martin family. For the past two years Mary (whose Tla-o-qui-aht name is Wenuk) has been employed by the Nuu-Chah-Nulth Healing Project, which she describes as “work with survivors of residential school and its intergenerational impacts.” It’s about understanding what people need to fully recover from trauma. It is respecting who they are, and utilizing their culture’s time-tested methods. “ The healing ways of our ancestors can help us now,” Mary stresses. Born in Tofino, Mary spent some years in Nanaimo completing her schooling. At one point in her youth she disappeared to Greece. Two years later she returned to Tofino with two beautiful babies. Before meeting Ed she had a third, and with Ed a fourth. You’d think she would have enough work to do, but after a year as the Nuu-Chah-Nulth’s Native Education Worker, she became the alcohol and drug counsellor for the Tla-o-qui-aht First Nation—endeavouring “to increase balance and respect” in the lives of her people. She carried out that project for seven years, during which time her own life met tragedy when a daughter died. Mary gives off a rare energy so tangible you can’t miss it: a quiet immovable strength which radiates unconditional love to everyone. She seems to heal by her presence alone. Which is why I’m crushed that she, along with Ed and daughter Trish, is moving to Nanaimo. In fact she had to interrupt her packing to introduce a film at the Clayoquot Community Theatre just the other night. It was a documentary about images of women in the media, and she is passionate about it, which makes sense since she raised three daughters. “ I first saw ‘Killing Us Softly’ on the Knowledge Network and knew I had to bring it to our community. I hope it can be used to help the Nuu-Chah-Nulth tribal council bring back balance through respecting each other. What does respect mean? What you do and what you say, goes out to the stars. When someone does something hurtful to you, don’t do it back. Whatever you put out there, you can never take back. Before the film, the audience listened without a whisper. Enriching words for anyone who finds it a challenge to fit in, faced on all sides with anorexic models with perfect hair and airbrushed skin. Now that the NCN Healing Project has ended, Mary is embarking on a new position as family support worker for a Nanaimo Native Friendship Centre called Tillicum Haus (Chinook for Friend). But “I’ll be back, because my family is here.” She has brothers who carve traditional canoes and nieces who paddle tourists around in them. Mary herself weaves fine cedar roses, baskets, whaler’s hats and other traditional regalia. Wenuk has indeed made a difference; how she carries herself has affected whole communities here on the west coast. Anyone who has met her has been touched, and when we feel ruffled or down, we can remember her and find comfort. But she’d better listen for knocking on her new door when folks from Opitsaht, Esowista, Tofino, Ahousaht, Ucluelet etc. come begging her to return! Chris Lowther is a local writer and activist who calls Clayoquot Sound her home. 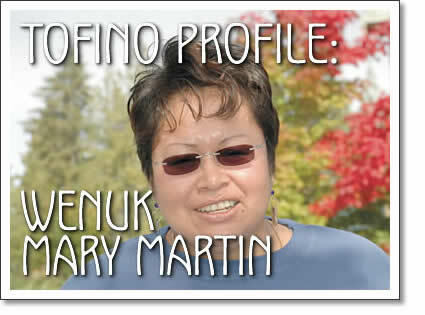 Tofino profile: Wenuk - Mary Martin is profiled by Tofino writer Chris Lowther in Tofino Time Magazine.